Do you want to sketch from a cropped photo?. Must your image fit into a particular layout?. Should the height and width be in a certain ratio? Should the printed size be a specified value? CropaRatio allows easy cropping against a white background. 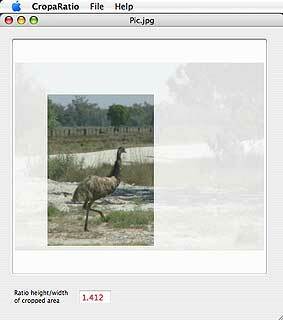 It displays the height/width ratio as you drag across an image and then lets you move the cropping rectangle around. It also allows the print size to be adjusted. Cropped images are saved as .jpg files. Rotated versions of an image can be created. The application works on Mac OSX 10.4 or later and is freeware. Help is available within the application and you can see more information here. An iPad version and an iPhone/iTouch version of CropaRatio are now available. See more information here.